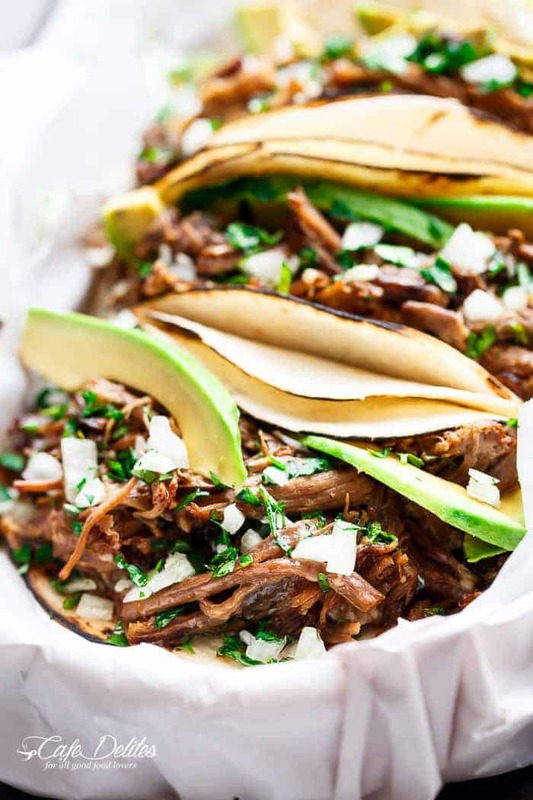 Slow Cooker Barbacoa Short Rib Tacos full of barbacoa flavours! Meat so tender it falls off the bone, stuffed into Taco’s and served with Avocado! 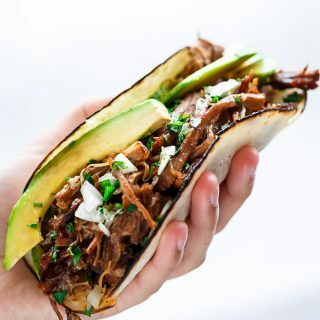 Slow Cooker Barbacoa Short Rib Tacos; what a perfect way to put a twist on an old classic recipe of regular tacos! 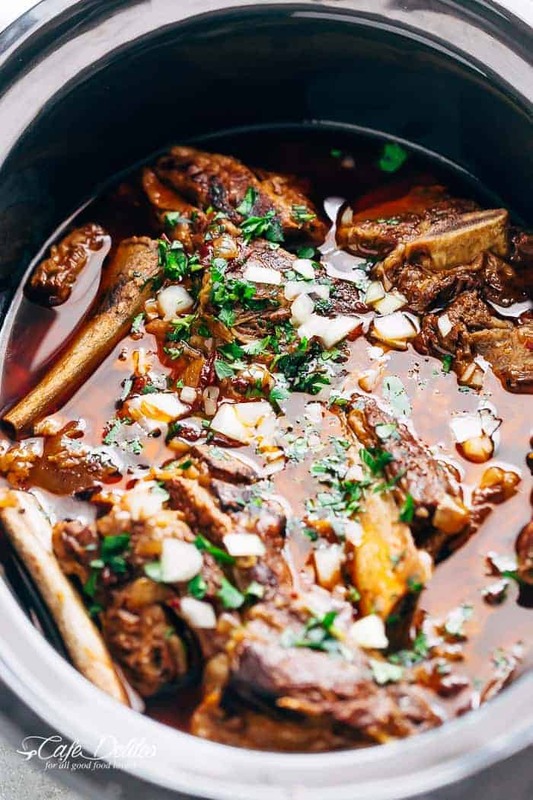 Slow Cooker Beef Short Ribs full of barbacoa flavours, with meat so tender it falls off the bone before being stuffed into Taco’s and served with sliced Avocados. The recipe include slow cooker, pressure cooker AND oven cooking methods! 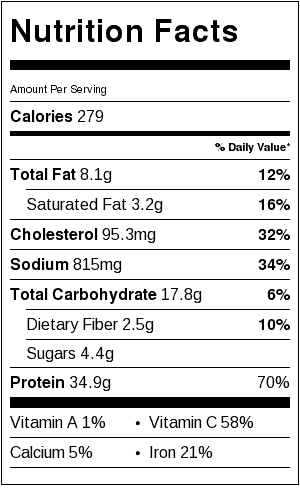 And GOOD NEWS: Nutritional labels are now being included for recipes situated underneath the recipe box! Let’s talk Barbacoa. 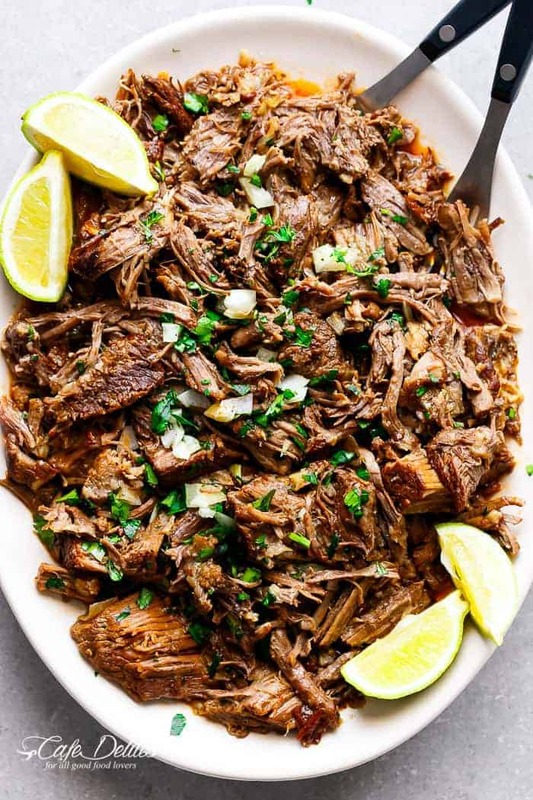 Even though barbacoa translates to barbecue, traditional Mexican barbacoa meat is steamed, smoked or slow-cooked over an open fire, or more traditionally, in a hole dug in the ground covered with Maguey (Agave) plant leaves, resulting in a moist and flavourful meat, often served with onions and cilantro (coriander to those of us on the other side of the world). Barbacoa is usually cooked with beef cheeks, or parts from the head of beef, most traditionally the whole head of the cow, and usually served for breakfast after the head has smoked over-night in a pit dug in the ground. Well, I don’t have a pit in my backyard, and I don’t have access to maguey leaves……or a cow’s head? Plus, I don’t think my husband would appreciate me digging a hole for the sake of this recipe. Or seeing a cows head. So slow cooker and short ribs it is! There is so much flavour going on in this pot! First, I used chipotle peppers in adobo, which provides smoke and heat to this recipe. If you’re in Australia, I usually buy them on Amazon here, or online from USA FOODS (there is also a USA FOODS store in Moorabbin if you’re in Melbourne). Fresh lime juice, cumin, garlic, and the addition of barbecue sauce makes these ribs amazing! You can serve these with anything: sour cream, plain yoghurt, tomatoes, lettuce, or whatever your stomach wants. 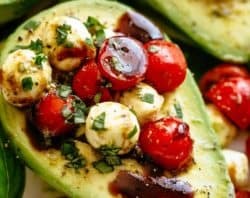 I chose the traditional cilantro and onion, with the addition of creamy avocado, which tastes incredible with the smokey spice of the peppers. 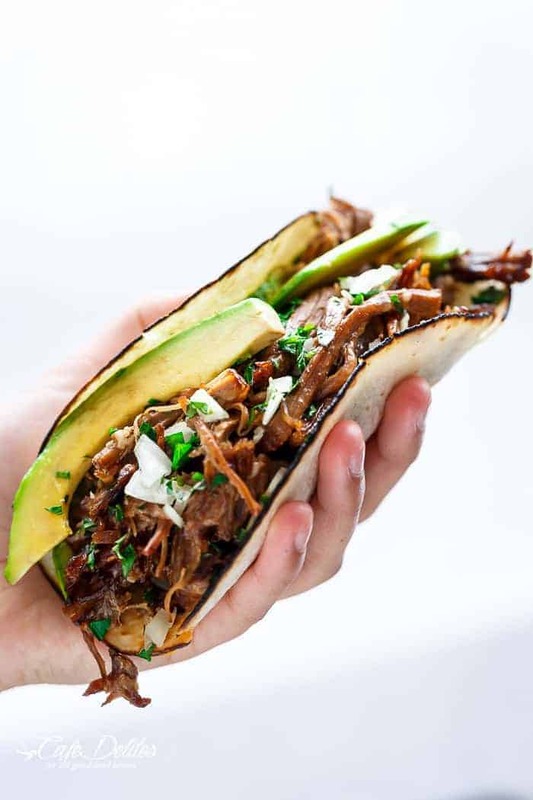 Slow Cooker Barbacoa Short Rib Tacos full of barbacoa flavours! Meat so tender it falls off the bone, stuffed into Taco's and served with Avocado! Heat the oil in a large skillet over medium-high heat. Trim as much visible fat as possible from each rib (optional but helps lessen the fat content). Brown the ribs in batches until browned on both sides (about 3-4 minutes each side, per batch). Transfer the browned ribs to a 6 litre slow cooker. 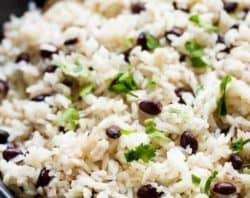 In a large jug, combine the chipotles, chipotle sauce, onion, garlic, barbecue sauce, lime juice, vinegar, bay leaves, cumin, salt, and broth together. Whisk well and pour over the ribs. Cover and cook for 6 hours on high or 10-12 hours on low, until the meat is falling off the bone. Allow the ribs to cool slightly in the sauce. Remove the ribs from the sauce. Remove any excess fat from the ribs; discard the bones and shred the meat. Using a metal spoon, skim the fat from the surface of the sauce in the slow cooker and discard. Mix the sauce into the meat and season with salt and pepper, to taste. 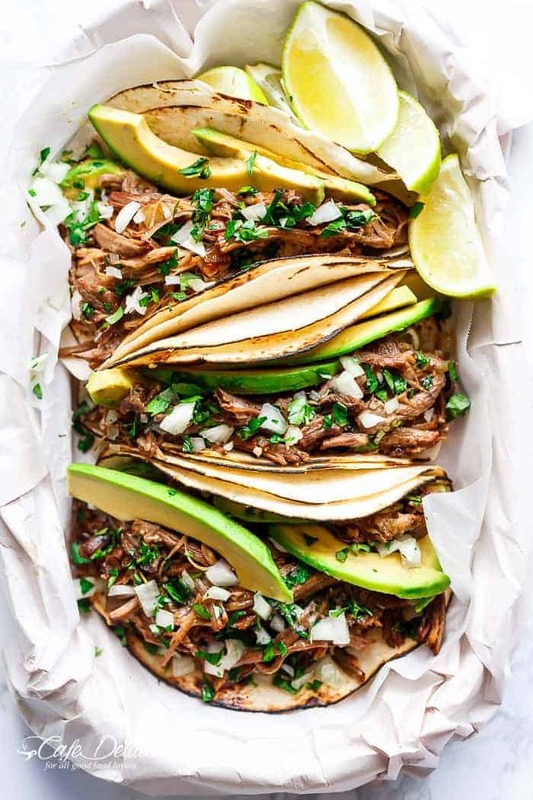 Spoon the meat and sauce into warm corn tortillas and serve with chopped fresh cilantro or parsley, the avocado slices and sour cream (or Crema). Once browned, place ribs in 2 large aluminium lined baking pan (or heavy based casserole pot). 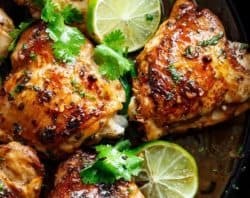 In a large jug, combine the chipotles, chipotle sauce, onion, garlic, barbecue sauce, lime juice, vinegar, bay leaves, cumin, salt, and broth together; cover baking pan and slow cook in the oven at 175°C | 350°F for 4 hours or until falling off the bone. Brown ribs in the cooker pot in batches until all browned. Transfer to a plate. Add the peppers, onion and garlic, and saute until onion is transparent. Add the rest of the ingredients (from barbecue sauce to broth), mix them well, then add the ribs back to the cooker pot. Cover and lock lid in place. Select High Pressure (or Meat / Poultry setting) and 50 minutes cook time. When cook time is complete, do a natural pressure release for 10 minutes and then release any remaining pressure (or follow your pressure cooker manufacturers instructions). Flavour is improved if cooked 1-2 days ahead. For leftovers: Cool completely first; cover and refrigerate on a ceramic plate (or in the same slow cooker bowl. Ensure the bowl is completely cold first). Remove any solidified fat before reheating. Nutrition calculation is based on ribs trimmed of all visible fat. Does not include optional fillings. This was INCREDIBLE! I grilled pineapple in the skillet that still had the juices from the sauce and added them to the tacos. The fresh sweetness from them was everything. I also had various other latin inspired season alls that i added to the sauce for extra flavor. Sooooo incredobly good and easy. 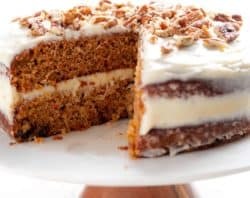 I’ve never made a Cafe Delites recipe my family didn’t love and this one is no exception! I used about 5 lbs of boneless short ribs and there was plenty of meat left over. We’ll be having leftovers in quesadillas for sure. Yum!! If using boneless ribs instead, how many pounds do I use? MADE THIS TONIGHT AND IT WAS AMAZING!!! Delish!!!!! This was very good. I used boneless short ribs. I only used one small can of chipotle in adobo sauce because I didn’t know how spicy it would be. It was very flavorful. These are really good. I made as is, and had delicious meat for tacos. These are traditionally served in our favorite area of Mexico with Shredded green cabbage, pickled onions, crema and avocado. We like that far better than the strong flavor of Cilantro or lots of parsley. Cabbage also ups the veggie count and helps to offset some of the fattiness. 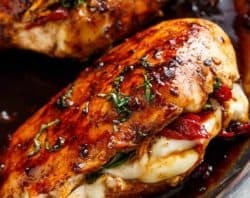 Hi, can I make with chuck roast chopped in pieces? Short ribs are expensive on Alaska. Thank you! Hi Annie! Yes, of course! I’m seriously about to dive head first into this slow cooker. And I mean that in the least harmful, most delicious way possible. I can’t WAIT to try this out! Spoon yummy! thank you!!! 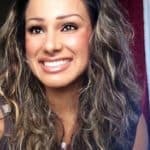 Love you site Karina! Is there something wrong with the links? I clicked on the link to see the Barbacoa taco recipe and I just get a picture of it with a bunch of pictures of other recipes. 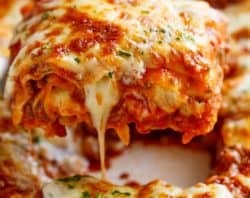 How can I get to the actual recipe?